Hot Pot in St. Michel - Fondue Kim Long - Shut up and eat. 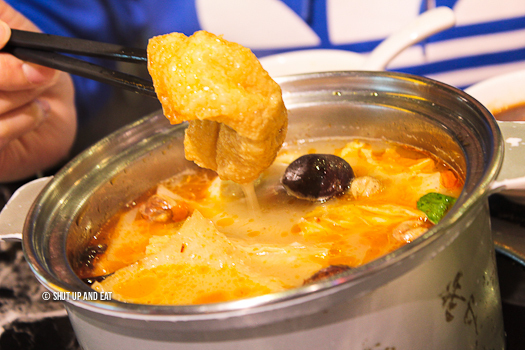 Have you ever been for Chinese hot pot (fondue)? I have fond memories of this Sunday night ritual around our house. Our family crowded around our kitchen table over a boiling pot of simmering aromatic brother sitting on a butane burner. 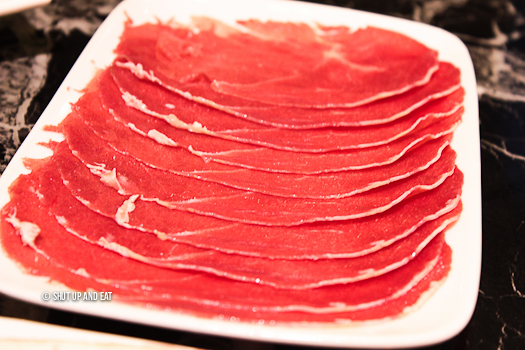 Cooking platefuls of quick cooking ingredients like thinly sliced beef and lamb, to noodles and strainers upon strainers and fresh greens was our family meal that ended the weekend. By fun I don’t actually mean the family fun time cooking over a communal pot; I’m talking about my dad yelling at my oldest sister for bailing to go out and see her boyfriend my parents didn’t like, the other two talking on the phone and being a picky eater and then me busting out a random nosebleed out of no where. 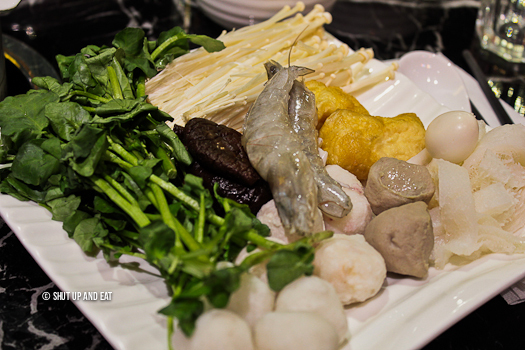 Whether or not you share this kind of memory or have never had hot pot before, here’s a spot where you can. I went Fondue Kim Long, this spot in St.Michel where pots are simmering and thankfully no one’s nose is bleeding. A quick rundown of Chinese hot pot: you pick your soup base, often offered in spicy and non spicy, pick your ingredients and you cook them in your own personalized (or communal) pot. I picked the non-spicy broth – a pre-emptive precautionary move to avoid any nose bleeds. 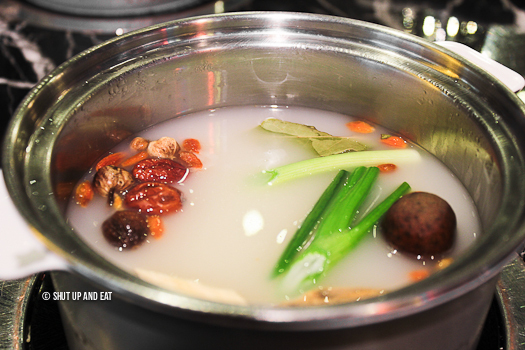 A pork bone and chicken based soup is laced with Chinese aromatics – nutmeg, dried dates, goji berries, dried longans, scallions, ginger and bay leaves. The spicy broth is the same soup base but with the addition of chili oil, cumin and dried chilies. My friend who is known to be able to handle her spice was taken aback from the tongue singeing heat from the soup. If you order this option, be sure that your mouth is naturally coated in asbestos. 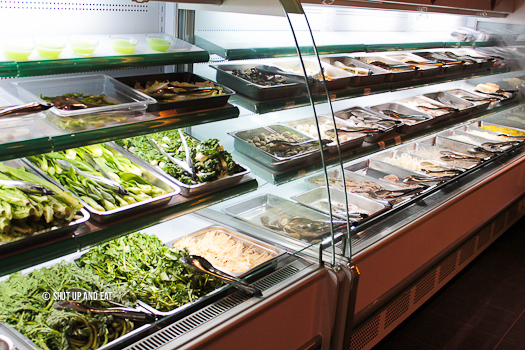 Kim Long’s market fridges are filled with almost everything you want or need to hot pot with. They’ve got 10 different types of noodles to choose; from udon to various rice noodles, ramen to soba. 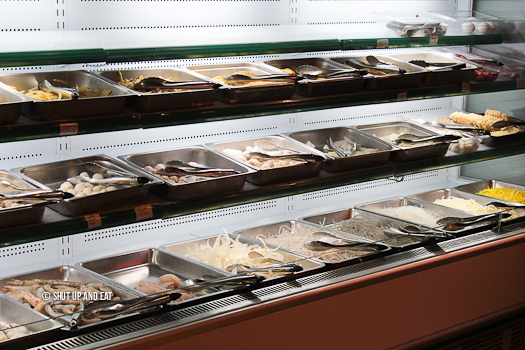 Their seafood section is decent, head-on shrimp, filets of fish, mussels, calamari and surimi as well as variety of balls – shrimp, crab, squid and beef. Their vegetable section is on point. Fresh selection of greens that take on all the delicious flavours that are steeped and seasoned into your simmering table-top pot. Taro, daikon, three different kinds of tofu also found in the fridges. 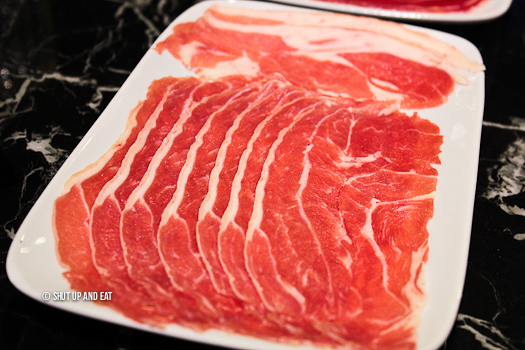 Fondue Kim Long offers freshly shaved beef to order. Plates of beef and lamb (which you have to order) as well as goodies from the fridges are bottomless, but pile accordingly, you’ll be charged for overzealous platefuls and your Eric Carmen hungry eyes. 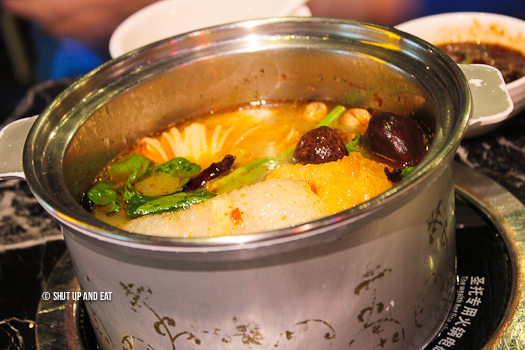 If you’ve never had hot pot before there are a few things that you should take note of. Like poaching anything else, there are certain things that will take longer to cook than others. As hungry as you may be, make sure your pot comes to a rolling boil and cook your food accordingly, there’s nothing less appealing than chomping down into a half cooked slice of daikon or shrimp head. Remember to make your way to the sauce station to mix your own concoction of hot pot dipping sauce with the available array of soy, sate, sesame paste and oil, chili, vinegar and spices. Try sate (bbq) sauce, soy, hoisin, garlic, and chili – it’s my favourite. 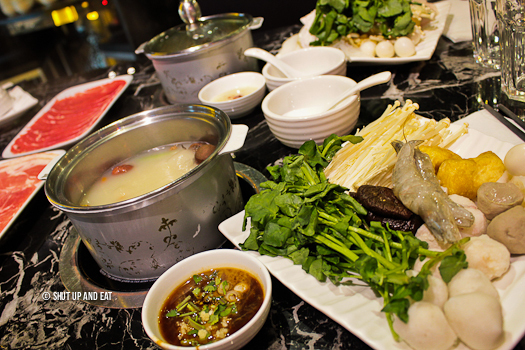 Hot pot isn’t a quick meal where you’re served a dish that’s ready to eat – obviously, you’re eating while you cook. It’s the experience. Yes, it’s fun to cook your own food and cook for each other on novel table top induction burners, but having hot pot is also about bringing people together; the discussion, interaction and communicating with the others (friends, family, other people you pretend to like) at the table. Bringing together people over food is how most meals should be enjoyed. Secret insider tip: Fondue Kim Long serves a sweet and sour tom yum soup base on weekends. Thanks! That sounds so good!